Today is going to be a long one. Tonight is the 1st open house for parents at school, and it’s the one I’m attending. So I’ll be at work until probably 8pm tonight, I’m not going home before Back to School Night starts. I have so many beginning-of-the-year things to do at this new job that I’m just going to plow through today. This means just a quick post to share something I want, found via The Zoe Report. Nothing too serious, but boy alive am I in love with these polishes. I have a thing about all things khaki anyway. Second only to my cardigan obsession (I have more than 18 now, I’m weak). Okay, maybe it’s 3rd behind cardigans and shoes. But still, I love khaki. And I live in brown polishes through the fall. 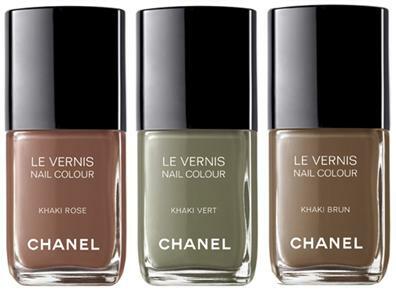 So I really want these Chanel polishes for fall. At least one of them to live in, maybe that brown on the right. Would This Qualify As a LOT of Cardigans?